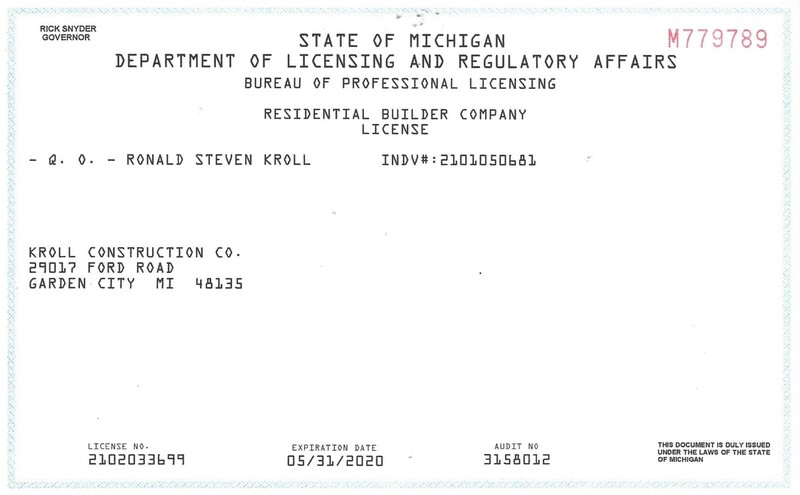 In order to provide the highest quality service and to deliver the peace of mind you deserve, Kroll Construction is fully licensed and insured, including both workers’ compensation coverage and $2 million in liability coverage. View our certificate here. If you hire a home improvement contractor without this insurance coverage and an accident occurs on your property, YOU may be held responsible and made to pay any damages! Make sure you obtain a certificate that proves insurance coverage (both liability and workers’ compensation) from any Michigan contractor you consider. Complete the request form at the right and we’ll schedule a FREE in-home consultation and estimate for your home improvement project. Or call us at (888) 338-6340 to schedule your free consultation by phone.